I’m a little late this week. My first story was on the popularity of Monster Energy Supercross and the NBC Gold streaming service, and how could potentially lead to European points-paying rounds. Then the lime controversy surfaced. In a 24-hour timespan, my previous ideas became completely irrelevant. My thoughts about expansion changed to; How did this happen, and what long term ramifications will this have on Supercross? I’ve seen the damage, to both human and machine; and what initially appeared minor is now looking much more severe. Lime has been used in tracks for as long as I can remember, my first experience was at the Denver Arenacross in 1997. I have a vivid memory of racing in Denver and being intimidated by the size of the whoops. I asked Oklahoma legend Cliff Palmer if the whoops would deteriorate, and he assured me with lime they don’t. Back then, Arenacross was mostly held in small, snow-covered towns and finding dry dirt was next to impossible. Tracks were often spongy and deteriorated quickly. I have no idea who decided to add lime to the tracks, but it quickly became the new normal. Lime kept tracks intact and allowed for better racing. Palmer told me they used lime so the whoops wouldn’t break down. In all honesty knowing concrete whoops were the new normal inspired me to go back to college. My initial thoughts in 1997 were all positive (outside my personal fears), but I probably would have signed off on asbestos jump faces if I thought they made racing better. In a sport where you hurl yourself through the air on a 220-pound machine, with inches between winning or a life-changing injury, being concerned with a skin irritation seemed frivolous. Now, 20 years later, I have an entirely different viewpoint and am concerned with anything and everything in Supercross that involves safety. Lime used in construction of tracks has become an afterthought. If used sparingly this might not have ever been an issue. What happened last Saturday in San Diego is what happens when poor communication and unrealistic expectations are placed on overworked employees. Track builders have earned a reputation of being wizards with their track design and preparation. Outside of rain hitting exactly at showtime, they usually have the track looking immaculate and race-ready. On Saturday it seemed like everything was going wrong, I didn’t understand the delayed practice schedule lining up with the forecast of rain arrival. All weather outlets predicted the rain would hold out until around 3:00pm. Why not have the first two practice and qualifying sessions before, then make all attempts to cover key parts of the track? I spoke with current and former racers and nobody could make sense of the schedule. I once had an official tell me as soon as the track is uncovered, it can’t be covered again. Does leaving it covered before the rain serve any benefit? The only logic I could assume was someone thought the rain would start sooner. I watched the track crew uncover the track, but despite their best attempts to keep the track dry multiple sections pooled with standing water. They did their best to drain water and add what I thought was dirt to these sections to restore the track to prime condition. Someone in the press box asked why the dirt had a hint of white and another joked, “It’s pixie dust.” We laughed because it’s been used for 20 years, why would we question safety? Currently details are still developing. Was a different chemical used? How much was used? Who decided to use it in standing water? Who is responsible for the damage? These are a few of the questions being asked. This season started with such promise as we have so many great on track storylines, unfortunately they will all be overshadowed by lime burns. I have empathy for both the riders and the track builders, but I also don’t have a chemical burn on my nether regions. All I can hope for is positive change from this incident and hope this will inspire dialog between promoters and the riders over this, and other safety issues. I love this sport and would be devastated if Supercross as we know it went away because of a mistake that had good intentions. 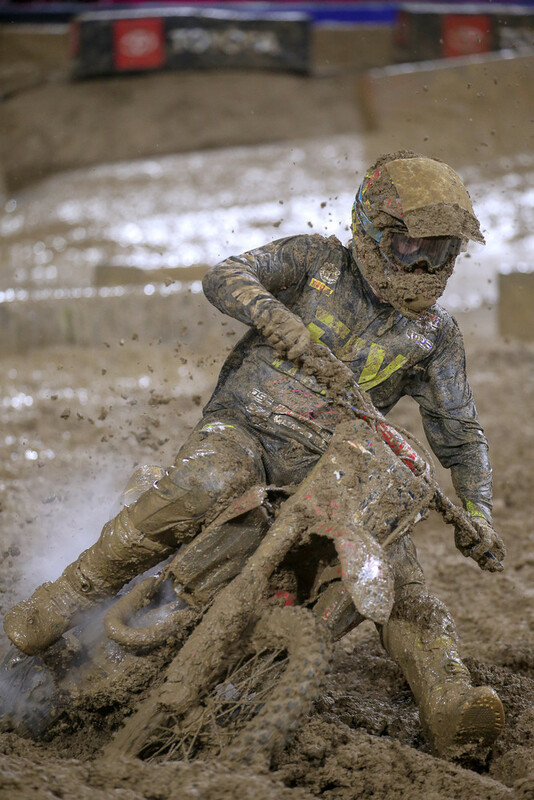 Ellenton, Fla. – February 5, 2019 – On Saturday, February 2nd at Petco Park in San Diego, Ca., Supercross riders were affected by a drying agent applied to the dirt track, which may have caused skin irritation and damage to their bikes. The wellbeing of our riders, their teams and our crew is always a top priority for us at all Supercross events. 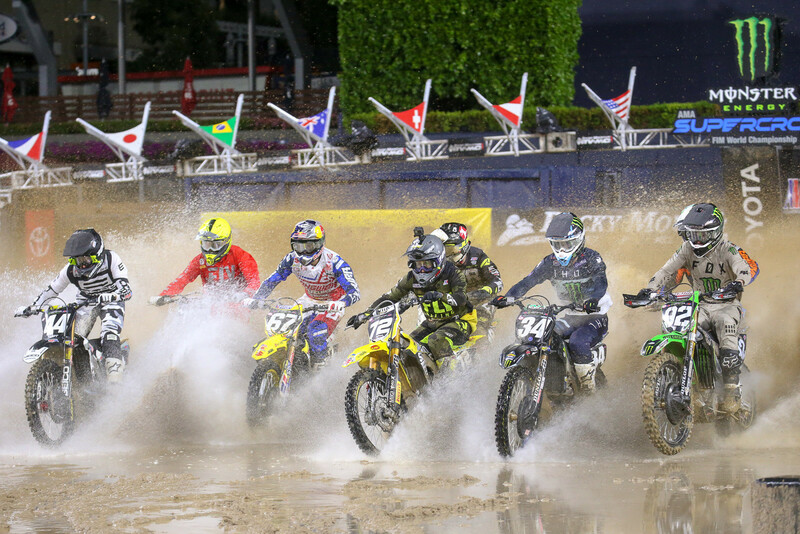 Given last week’s forecast of rain for Saturday’s event in San Diego, the track crew took normal precautions to ensure a safe and raceable track. Prior to the qualifying rounds and main events, they removed the protective tarp and applied a drying agent, a lime and sand mixture, to treat two areas on the track to try and remove moisture from the dirt. This process has been used safely for decades at Supercross to dry dirt and thereby reduce the risk of accidents for the riders. It appears that the unprecedented amount of rain on Saturday prevented the lime from mixing with the soil as usual. This resulted in splashing of the riders and their bikes, which may have caused skin irritation to some riders and damage to their bikes. We are currently reaching out to each rider who participated in Saturday’s race to assess the extent of the impact, ensure their welfare and get them back on their bikes racing. We are also reviewing our existing processes to deal with excessive water on the track to prevent a recurrence. The Denver SX in April was scheduling Mistake. Colorado is known for Heavy snow in April and March. It may be 60+ degrees the next day but Whats the cure for a foot of melting snow? I think Supercross is big enough now to go to nothing but enclosed Football stadiums. 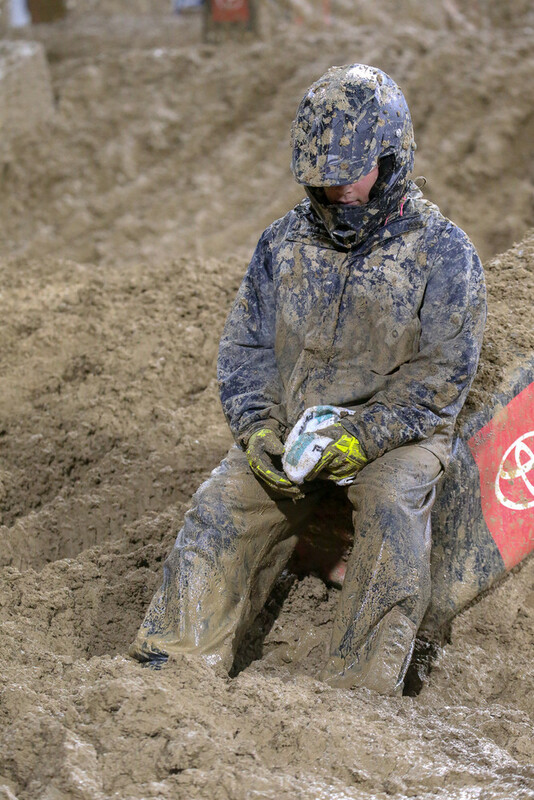 I love rain or shine outdoors at the nationals, but maybe not so much at a Supercross race. People pay to see these riders jump obstacles, not ride on plywood through a 3 foot rut. Supercross is dangerous already, The drying agents needs to at least be left out for now. I think in the future maybe just go to stadiums that are bigger, with a roof. Soon there will be a new stadium in L.A. and Vegas for the finally. What is it 16 or 17 rounds? They have enough good stadiums coming to stay out of this issue. Fold was required to notify MSA. But don't worry I CALLED them for you. MSA and San diego county together will are conducting a investigations. Lots of environmental laws were broken. And big time being that close to the ocean. This could be in the millions if the dirt is considered costick 10.000 of dollars per truck load to remove it. work environment it is fine ??? See you next Tuesday AMA ! I still haven’t been given a good explanation as to why they delayed practice while the weather was perfect. I do disagree when you say a “sad state of affairs”. The sport is currently on an upswing on the professional and amateur levels. Obviously it’s far from perfect, but I think it will continue to improve. any pictures of the bike damage? i've seen the chemical burns on the riders. What a bunch of crap. So these guys are held to an unreasonable expectation of what they can/can’t put in their bodies. They can’t take a cold medicine without worrying about getting suspended indefinitely. But Feld and the track crew can unknowingly expose them to lime. Any amount of research of lime that’s added to concrete shows that it causes skin burns and further health problems. I think it’s time that Feld is held accountable and fined by OSHA. Thus giving the fine back to the riders they are endangering. Maybe Brock tickle’s so called failed substance test came back positive for lime. Just saying. I totally understand and am also pissed about the ridiculous treatment of Broc Tickle. IMO leaving OSHA out of this benefits everyone, sounds like Feld is proactively looking to make it right. Adding another organization to impose fines and sanctions isn’t going to fix those bikes, if the riders are satisfied with Feld’s effort I say let’s chalk it up to a bad situation and move forward. So the riders have to answer to Feld, WADA, and the AMA and went things go sideways it Isually ends up resulting in suspension. Most of the time long term suspension possible career ending suspensions. But when one of those entities screw up They should be able to just come to the table with a beer and say “ hey boys let’s work this out! We don’t need this to go any farther than this. We will fix this for ya! Sounds like a one way street to me. Unfortunately until these riders get off their asses and get together they have no power. Exactly. And what better time to band together than now. When you have the promoter/owner of the series in a pickle. But yet everyone just wants sweep it under the rug and make it go away including yourself. If that happens the promoters will just continue doing what they do. They need to be held accountable just as much as the riders. And for the record. I don’t care about the bike damage. Bike damage can be fixed. They guys that are getting skins burns and are getting exposed to a known carcinogen on purpose for Feld to make more money. Hold them accountable now. If that means shutting down for awhile then do be it. Any other workplace would be shut down for this type of activity. Cancer chemicals in your mouth and being blinded by them is OK. Deer Antler spray from GNC in your mouth....banned for life. Even though it states that they are following up with riders - they never admitted that it DID cause burns. That was written by a lawyer with 1 thought in mind: we have been doing this for 20 years, don’t sue us. I get it, I hope they take care of the damage and avoid a lawsuit. Maybe we can all have a good laugh about this in a few weeks..... Maybe? GuyB, I presume these are your photos? Outstanding lighting, exposure, depth of field. They stand out. Also thought the writing is well done. I look forward to reading more of Cooksey. Thanks, how epic is the shot of heat 1 heading into the water? GuyB is a wizard with the camera.